In the lead up to the NYC marathon, Bobby Curtis is blogging for the folks at FloTrack.org. His "4 Weeks Out" entry is reproduced below. Click HERE to go to the original FloTrack feature. Below is a detailed summary of my week of running. I’ve included two pictures from the week as well. Monday: 9 miles AM, 6 miles PM. Very easy day, 7:00 mile pace, maybe slower. 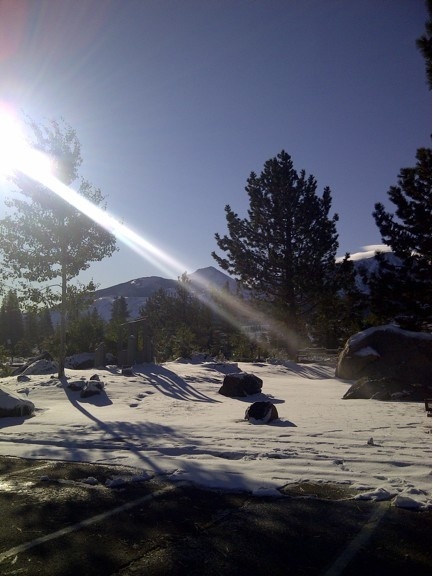 Thursday: 7000 ft. 9 miles in the AM, 6 miles in the PM. Slow runs, 6:40-7:00 mile pace. Friday: 7000ft. 15-mile tempo. A continuous effort of 4 X 1.5 miles @ 5:00 pace, 1.5 miles @ 5:30 pace and 1 mile @ 6:00 pace, no 6:00 mile at the end to make it 15 miles. Plus warm up & down. HR was all over the place, mostly a reflection of the hills and wind not the pace variation. 6 miles slow in the PM. Saturday: 7000ft. 8 miles in AM, 6 miles in PM. Slow pace 6:40 to 7:10 miles. Sunday: 7500 ft. 23.5 miles in the AM. Started slowly, first hour roughly 6:30 miles, then some near 6:00 miles for next hour, ran the last 5 miles at roughly 5:50 pace. 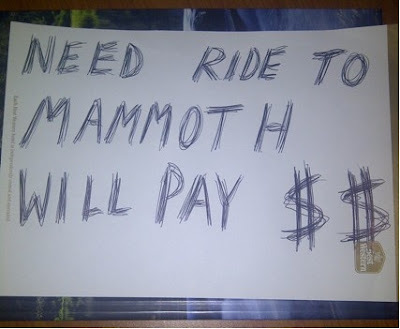 This photo was of a sign I made in the Reno Airport when none of the car rental companies would rent me a car one-way to Mammoth. Didn’t work, should’ve shaved and pressed my shirt.